After fishing through various press-shots of one William Francis, aka William Control, one obvious characteristic leaps out of many of them. It's not his chiselled cheekbones, the luxuriant quiff or the deep stare, but his most-used prop - the man does like his cigarettes, which immediately puts him at a disadvantage with the PC health-brigades but lends an element of 'tut-tut' cool to his image (not that we're condoning the practice of chugging on fags, naturally). Normally, aside from being down the local newsagents buying twenty Rothmans, William can be found fronting alt-rockers Aiden, who themselves dabble in a dash of darkness and gothic imagery and who picked up two awards in 2006 for Best Newcomer with both Metal Hammer and Kerrang!. 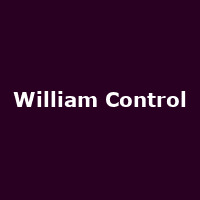 As William Control however, things get a little less rocky and a lot darker, all laced with synths and drum-machines and tagged with eerily morbid song-titles like "Come Die with Me", "The Velvet Warms and Binds" and "Letters From Other Side", examples of a few contained on his new album, "Silentum Amoris". Oh and he's taken the time to have a crack at Joy Division's sacred grail, "Atmosphere" and Daniel Johnston's elegiac "True Love Will Find You in the End". Yes, you can see where Mr Francis is going with all of this jollity and if you 'get' him, you may also get him. In fact pretty soon you'll be getting the man himself - he's coming over to these shores to promote the new album (released this week). His keenly-priced New Faith Tour will commence in Cardiff on 26th May and then continue around most of the UK with three of the shows set to go on sale from tomorrow (Thursday) at 3pm (Birmingham and Islington) and on Friday 6th April (Newcastle). Ticket prices are a very reasonable £10 (except London, which will cost £11). Support for the entire tour comes from gothic-rockers Fearless Vampire Killers [UK] and West Bromwich's Obscure Pleasures.